The official emblem of the USS MONTANA is a powerful reflection of the history, culture, and values that all who sail aboard this modern warship carry to any part of the world in defense of our nation. recent settlers and today’s visitors. USS MONTANA (AC 13) commissioned in 1908. She served with distinction through and beyond World War I.
Flanking the mountain vista below the star is a fascinating two-dolphin representation of Navy and submariner connection to the State of Montana’s motto, Oro y Plata. gold and silver dolphins are worn by qualified submariners (gold by officers, silver by enlisted sailors). The gold and silver theme is carried through the entire emblem. On the right side of the Montana state outline is one of the more moving emblem symbols chosen by MONTANA’s crew. It is two eagle feathers representing the values, culture, and courage of Native American warriors and their tribes throughout Montana as they have defended their land and way of life throughout history – and as they have fought for the United States of America in every modern conflict. The feathers have leather thongs whose colors and designs represent the flags of the United States and Montana. Our Montana tribes honor their veterans continually, and this part of the emblem was inspired by an extraordinary Tribal veterans memorial in Montana. has commanded utmost respect, as will the USS MONTANA. The powerful portrayal of the USS MONTANA conveys a sense that she is ready to dive to an operating depth where she will remain silently on guard, “on scene, unseen”. At the bottom of the emblem is 3-7-77. This symbol is associated with Montana’s early citizen Vigilantes who sought in the late 1800s to bring frontier justice to parts of the Montana Territory. Disagreement remains about the exact origin of the numbers (whether grave dimensions, time allowed to catch a train or stagecoach to somewhere far away, or something else…), but their warning was clear. If 3-7-77 showed up on a suspected outlaw’s property, he knew that bad things were about to happen, and he might want to high-tail it out of town. Even today the symbol can be seen on the Montana Highway Patrol car that pulls over the speeding motorist, and on emblems worn by some Montana National Guard members. The USS MONTANA crew has chosen to be called the Vigilantes of the Deep and will always carry this calling card to dangerous places in the world as they do their part to ensure maintenance of peace through strength. May it defend our way of life. 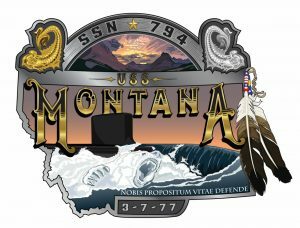 Copyright © 2019 by the USS Montana Committee, supporting the commissioning and crew of SSN 794.